Isle of Wight, attractions and things to do with personal recommendations for the visitor. The Isle of Wight is our favourite place in which to take a holiday, so much so that this website has been created so more people may discover some of the natural beauty and attractions this Island has to offer. Information, pictures and personal recommendations have been gathered which may hopefully assist the visitor to this great Island. The Isle of Wight is a diamond shaped Island that is just 23 miles wide and 13 miles high. It is situated at the far South of Great Britain, sandwiched between France and the UK and is just 3 miles from Portsmouth's coast. Personally recommended attractions on the Island, to relaxing at the pubs or on one of the Islands excellent beaches. We have a number of photo galleries for you to explore, along with links to related websites. We also have a section on tips for the visitor to The Island from our personal experience and a miscellaneous gallery. Do you want something to do apart from the attractions? - Then look at the things to do section, there are some fine walks to enjoy. Readers' memories and readers picture gallery pages. My favourite pictures. In addition to information about fun days out, we also have a section on environmental issues, looking at the effects of erosion and landslip on The Isle of Wight. For returning visitors have a look at What's new? The Monkey Haven near Newport is a new family-run self-built project which has been created to provide a safe, happy environment for primates and birds of prey who find themselves without a home. Carisbrooke Castle, near Carisbrooke. Great family attraction with plenty of things to do inside and out. King Charles 1 spent his last year imprisoned here before being executed. Two Medieval deep wells, Castle Keep, famous donkeys and the battlements to explore. Ventnor Botanic Gardens. This is an interesting place for a pleasant amble amongst sub-tropical and exotic plants and trees from around the world. The very small and quaint Steephill Cove is nearby as well. Isle of Wight Zoo Yaverland seafront adjacent to Sandown is a great award winning attraction for the family. They specialise in the care and conservation of big cats and Madagascan animals. Excellent keeper talks - a real friendly zoo. Shanklin beach. Just one of many great beaches to enjoy when the weather is just right. There are large or small beaches, commercialised or secluded - the choice is yours. There are 15 personally recommended beaches in our beach guide. The Taverners, Godshill is just one of the many great pubs to appreciate for a drink or some food. 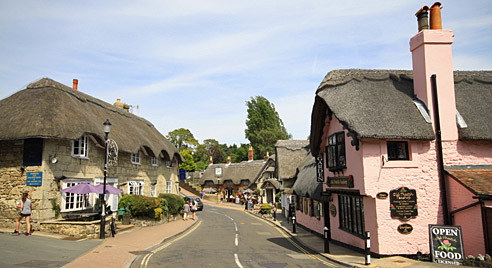 There are many unique pubs here, and some are thatched. For more information visit our mini pub guide, compiled from our personal experience and recommendation. © 2017. All photographs on this site may not be reproduced, copied or used for other means without our prior permission.